NASA announced its Asteroid Initiative in 2013. The Initiative include the Asteroid Grand Challenge, announced in June of that year. The Grand Challenge seems to be an idea to help close a gap not filled by the Near Earth Object Observing Program. That Program has found ninety-five percent of all near-Earth asteroids one kilometer or greater in diameter. However, current estimates suggest that not even ten percent of objects smaller than 300 meters in diameter and less than one percent of objects smaller than 100 meters in diameter have been found. There will be an overview of the Asteroid Grand Challenge presented to the public at HRPO on Friday, 7 February at 7:30pm. 1) Visit a large near-Earth asteroid. 2) Collect a multi-ton boulder from the asteroid's surface. 3) Redirect the boulder into a stable orbit around the Moon. 4) Send astronauts to explore it and return to Earth with samples. The timeline is to have step four occur at least by the 2020s. Today at 12pm CDT Smithsonian's National Air and Space Museum will have presentation on ARM. This presentation will broadcast on NASA-TV1 and NASA-TV2. The Asteroid Redirect Mission is mentioned in NASA's review of the agency's top stories of 2015. This review will be shown on NASA-TV1 and NASA-TV2 at least twenty times between now and the end of the year. The STEM in 30 program "Asteroid Redirect Mission" will be rebroadcast tomorrow at 10:30pm and Sunday at 6:30am on NASA-TV1 and NASA-TV2. With workshops running September 2011 to April 2014, the Asteroid Return Mission Study investigated how practical it would be to find, survey and robotically capture and return to Earth vicinity a whole asteroid for scientific investigation and to serve as a testing ground for human activity on an asteroid. The STEM in 30 program "Asteroid Redirect Mission" will be rebroadcast tonight at 10:30pm on NASA-TV1 and NASA-TV2. The STEM in 30 program "Asteroid Redirect Mission" will be rebroadcast tonight at 10:30pm CST and tomorrow night at 10:30pm CST on NASA-TV1 and NASA-TV2. 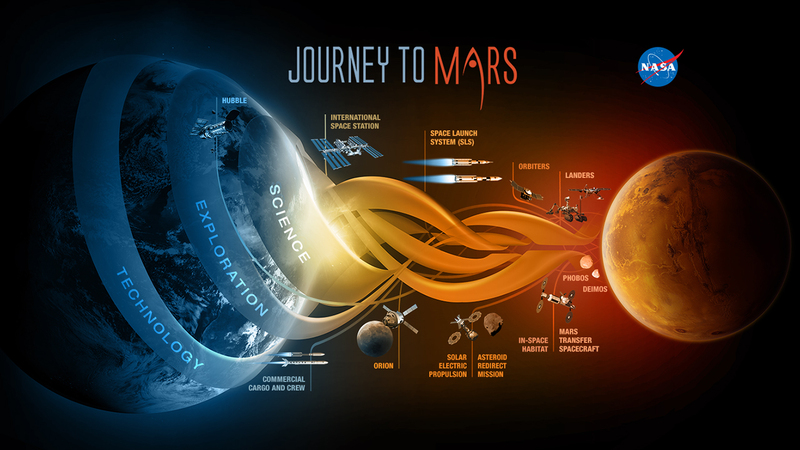 The beautiful and evocative Journey to Mars shows the intertwining of science, exploration and technology which make up our goal to visit and then inhabit the Red Planet. At this time both NASA-TVs are broadcasting an update on the Asteroid Redirect Mission from Goddard Space Flight Center. The update will be rebroadcast at 3pm CDT and 7pm CDT. It will also be rebroadcast tomorrow at 12am CDT on NASA-TV1, and 7am CDT and 8pm CDT on NASA-TV3. Asteroid Day just took place. NASA had a live program Friday called "Every Day is Asteroid Day". This program will be rebroadcast on both NASA-TVs at 5pm. Visitors to the Highland Road Park Observatory can watch it while hoping to see Mercury during this afternoon's telescope viewing session.